#1 Banned: The metaphorical heart. “Heartburn” is allowed, however. “Heartache” too, only if a coronary is involved. #2 The moon is always “distant”. It’s not like we are going to forget. #3 Why not just call them “line-fractures” or “fractured lines” if that’s really what you mean? It’s a line ending, people. #4 Only one poem about writing poems a year. They are all the same poem written when we have nothing to say. #5: Epigraphs. From the Bible always use original Hebrew or Greek–it throws off the God-haters, and you get to look smart. #7: If the poem came from God don’t ask me to edit God. #9: Metaphors are hams, divas; they hate to share the limelight and too many in a room can be blinding. #10: A simile in a simile in a simile in a simile is a brilliant parlor trick, yes, but it’s not great for poems. #11: Rhyming is one of the most under-appreciated forms poetic of improvisation. #12: More often than not a well chosen verb makes an adjective superfluous. #14: “Difficult” does not necessarily mean “Deep”. #15: Ekphrasis: great way to rip off ready made images and get credit for it. #16: Exercise: “carriage”/ “porridge”–shape a couplet with that rhyme. GO! #17: The poet’s bane is the gap between the beauty of a vision and the limits of her language to express that vision. #18: If a poem’s clues are hard to crack the jackpot better be worth the effort. #20: Some moments demand a sermon, or a speech, or fist, or a bowl of water, or a rose, not a poem. #21: To say “it’s raining chipmunks and squirrels” always trumps saying “it’s raining cats and dogs”. #22: Often cutting a line is the easy fix, not the best fix. #23: Perhaps all memory is fiction & all fiction is memory. #24: Writing a poem is not the same as publishing a poem. No one’s watching, so let ‘er rip. #25: If you do not read poetry to avoid being influenced, save me from the same fate: don’t ask me to read your poems. #26: One day the teacher asked of a poem “what does it mean?”. It all went downhill from there. #27: Unfair, yes, but the days of forced syntax to suit meter and rhyme are gone. Now it’s rhyme, meter AND natural syntax. #28: At their best our poems have taught us things we never knew we knew. We just have to let them. #29: Here is a tricky one: the poem is not so much in the image itself but in the moment that demands the image. Consider it. #30: Call it subconscious, call it art, but a poem wants to go where it wants to go. If you let it, aahh, bright wings! #31: The poem, too, is sound: the music of vowels, consonants, stresses, silences, rhythms, tones–a universe before meaning. #32: Morning workout: Describe a scent without a simile or adjective. Do five reps.
#33: The best improvisers are those with the broadest palette of choices. Wise poets keep adding to their palette of choices. #35: Can a musician be great without mastery of her instrument? Can a poet be great without mastery of her instrument? #36: You can write about anything you want, but some subjects come with greater responsibility than you may want to take on. #37: Poets, a lot can be learnt from the timing of the best comics: pacing, economy, judiciousness, silence, rhythm, reward. #38: Most folks fear that a poet is merely someone who knows something and expends all energy making it unknowable. #39: Exercise: Write a love poem without the word ‘love’ as noun, verb, or adjective. #40: Poetic Stamina: A six hundred word sentence of seamless, most natural language. #43: Writer’s block is a myth we writers invented to blame something other than our lack of anything interesting to say. #44: There’s nothing sacred about a first draft. It is merely a doorway; walk in; see the rich vistas spread for you..
#45: If you lose your note book full of poems, weep for a day, then fill another notebook. #46: When you accept that not everything you write is special you will write much more than you ever dreamed you could. #47: At the very least find out why they say the “greats” are great before you dismiss them for being dead and not like you. #48: Original? Not so much. Like it or not we are shaped by poems we read and hear. Good stuff in…You know the rest. #49: The high bar: “to purify the dialect of the tribe”. How is that going? #50: Sometimes a poem is hard because it’s trying to say hard things. #51: We trade in feeling. It is the poets’ first currency. # 52: The true art is knowing how to discern what is interesting and what is not interesting. #55: A part of the poet’s mind will always be elsewhere: sifting, prospecting, foraging for what must be kept. Pity her. #56: To steal from the poet you must kill the poet–come to the page with your hands slick with blood and sweat…and tears. #57: You never hear a carpenter complain of carpenter’s block, do you? #58: The best poems are fantastically organic, they grow as we grow, in depth, complexity and power. #59: A poem will not build a bridge, nor will laughter, yet we keep laughing. #60: Every new child, every casket, every wedding kiss deserves the blessing of an elegantly crafted, true and honest poem. #61: Imagination is dime a dozen, the thing the sets the poet apart is craft. #62: Perhaps not you, but some poets believe we serve a community with our art. This, too, is noble service. This too is art. #63: Who shall be our poet now?”–a boy exclaimed at Robert Burns’ funeral. An most enviable eulogy for a poet. #64: A worthwhile Lowell thought: “The poem is the event not the record of an event”–a mantra narrative poets should chant. #65: The sin that keeps on giving: Envy among poets. #66: Poetry: Think a horse in full gallop, the rider goading, coaxing, hanging on–HALLELUJAH!!! #68: “There is a perception that the desert is emptiness, desert is nothing.” No, it is the poet’s playground. #69: Treat all poems like a building–come to them from all angles, enter each room till you find the best way in. # 70: “I write for myself.” A quaint motto for poets, especially those flogging their books in the market place. #71: Sometimes too much knowledge stymies the imagination. Art is found in the balance. #72: A city is a pulsing, breathing, idiosyncratic organism waiting to be discovered, written street by street, lane by lane. #73: There is little new under the sun, but our art is to combine ordinary things to make something extraordinarily new. #74: Whole crispy sea bass, steamed sea bass, a bed of greens, soy sauce, friends communing is what a poem, well-made, can be. #75: A poem knows its way around a dense forest of prayers–the dialect if familiar. #76: In the names of a city’s streets lie the secrets of its making and unmaking. In the calculus of names lie poems. #77: Plato was wrong: the landscape of the imagination materializes the real. The mystery of our art: we live in our heads. #78: Plato was right: Poets are dangerous–they unsettle the idea of reality. They speak in tongues. #79: Tongues: the irrational utterances of the heart; the language of groans and moans. Poets must sometimes speak in tongues. #80: A true poetic line is like a cover drive: fierce, balanced, timed, fluid, effortless, assured, graceful, and irrevocable. #81: Like a haunting scent, a good image evokes a universe of feeling and thought. They are rare, but we keep trying. # 82: Great chefs remind us constantly that we can train our palettes in the pleasures of good taste. Great chefs are poets. # 84: We learn where our truest poetic voice when we admit to the poems we secretly love–not those we think we should love. #87: Often our poems take the shape of the page we write on. Choose well, embracing variety. #88: Sometimes the quality of light is all the music we need to sing poems. #89: Sometimes before the idea or even the thought, there is that swirling eddy of feeling driving us to make. #90: I envy music’s ability to move without words. I reach always for the craft of sound in my poems–a sweet frustration. #91: Fishing guides and mushroom hunters are poets–they know the secret places of plenty and fiercely guard this knowledge. #92: Were poetry my religion what would there be to aspire for with poetry? #93: Eventually, unpredictability becomes predictably unpredictable. #94: You will find, if you try to describe a taste without simile or adjective, why poets turn to metaphor and metonymy. #99: In Jamaican, to create the superlative we double or triple the words: what a sweet-sweet way to write. #100: I cannot give you your model for a poet for your times–I have Bob Marley; my art has Marley’s example. I’m grateful. #101: The dubious good fortune of poets: Our tragedies can become the source of elegant poems. #102: It is my fantasy that everyone is capable of at least one great poem–how fantastic is that? #103: They say Mandelstam would compose his poems aloud and his wife would memorize them. The path to poetic hubris or joy? #104: After silence, poems will come. 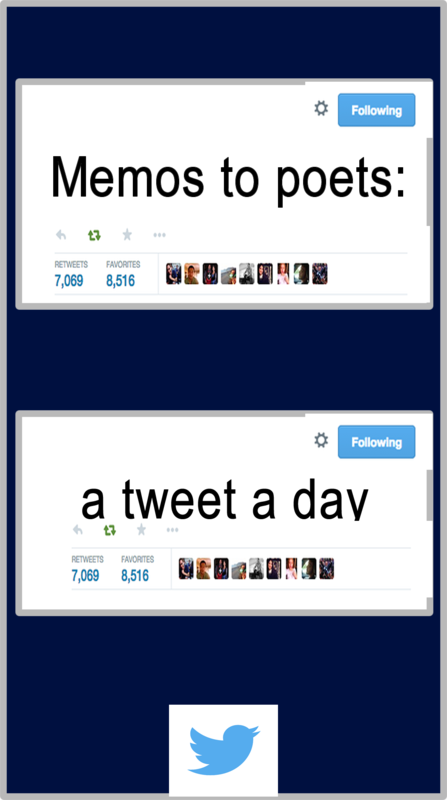 So will memos to poets. #107: Study Lee Scratch Perry, poets, and learn the are of the populist surreal. Genius manses! #108: We learn by allowing ourselves to enter places where we are ignorant and then listen, try to learn, then start again. #109 Nothing wrong with navel gazing if you navels are interesting. (Yes I said navelS). #110 So it rhymes and pentameters, so what?